Canela, in recent years, has become a regional center for ecotourism. And Gramado, just 3.5 miles away, is her chicer sister. During every season, you can come here to enjoy regular festivals and celebrations. Gramado is also the place to buy knits and leather goods. 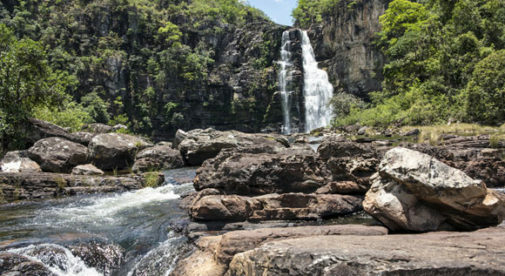 Canela, in the Serra Gaucha region of the Rio Grande do Sol, has become a regional center for ecotourism. At the western end of the Serra lies Bento Goncalves, the center of Brazil’s nascent wine industry. It’s a popular spot for folks to spend a few days at a hotel or spa relaxing and drinking in the scenery, as well as the wines. Dotting the hillsides, you’ll find a lot of smaller towns, each with its own personality and attractions, from Garibaldi, where you can ride in a steam locomotive, to Novo Petropolis, where German is sometimes heard on the streets. And wherever you go in the Serra, you’ll encounter good food at reasonable—sometimes exceptional—prices: lots of pasta and sausages, reflecting the area’s Italian and German heritages. Capeletti, a soup of pasta balls in chicken stock appears on almost every menu. Pullet and mountain trout are also Serra specialties. A basic all-you-can-eat lunch buffet is $6. A more upscale spot will cost you $10. The food is uniformly excellent, the establishments spotless, and the service uniformly attentive. 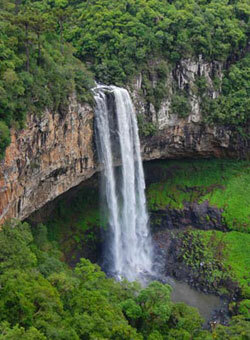 The Serra experiences four seasons; the weather here attracts many Brazilians. I can see why. Personally, after numerous summers sweltering in Rio and more in Florida before that, I find the climate in Serra Gaucha energizing. In the summer, the daily temperatures average about 90 F. In the winter, it drops to around freezing on a few days, with even an occasional light snowfall. Between hiking and cool nights, I sleep very well. There’s a mix of apartment homes in town and houses in new planned communities on the outskirts. You can find new two-bedroom, two-bathroom apartments for around $130,000. I found a great rental. My apartment has an open-floor plan downstairs with a sitting area, dining area with large table and six chairs, a roomy kitchen, and half-bathroom. Upstairs is a full bathroom and two bedrooms. The unit came fully furnished. Including water, electricity, and high-speed internet, I pay $550 per month. The location is excellent. I can walk to my gym in 10 minutes. The bank, stores, and restaurants are even closer.